Should You Use a Smartwatch When You Travel? What Can You Bring on an Airplane? What's the Deal With Load Lifters? Polyester vs. Nylon: Which is Better? Write this down: travel journals are awesome. Despite every traveler using their phone to take pictures, book accommodation, and connect with new friends, there’s still a strong argument for keeping a travel journal. And yes, I mean a real life, physical travel journal. Don’t roll your eyes. Sure, videos and pictures are incredible, but how many of you actually look at all the thousands of files in your library once you get back home? And how have those photos aged over the years? I have some sweet 2 megapixel beauties from my early days of travel that are so chunky and withered with decades of degradation that it looks like 8-bit Super Mario. And pictures get lost. Files fade, hard drives fail, and, honestly, you can lose great pictures in the haystack of thousands of files that you never look at again. 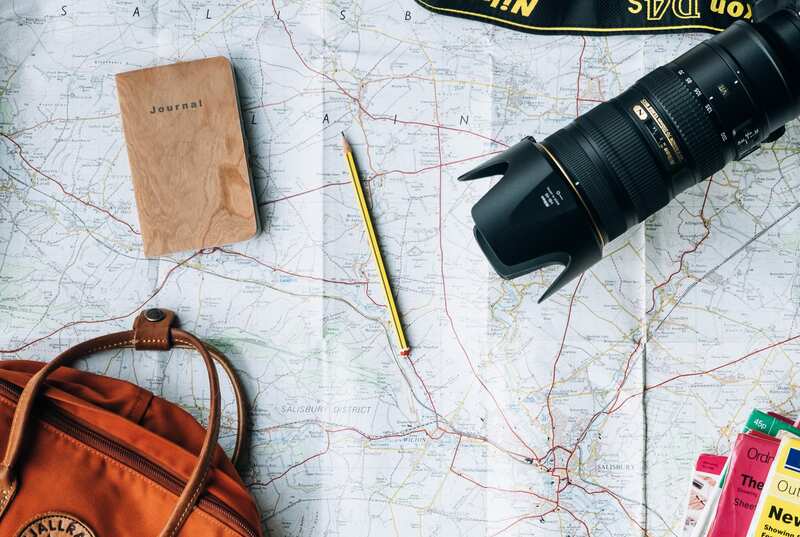 So how do you actually capture the feeling and moments of your next big adventure? You write them down. Scribbled thoughts. Recollections of the previous night’s chaos. Even old hotel reservations and weird email addresses can unlock a flood of memories, much like smelling a familiar scent can send you back in time to a specific memory. And what’s great is that travel journals have embraced the cloud. It’s never been easier to backup, remix, and share your thoughts, mini blog posts, location, pics, and stories with friends and family via cloud based travel journals and integrated apps. Travel journals aren’t a thing of the past. 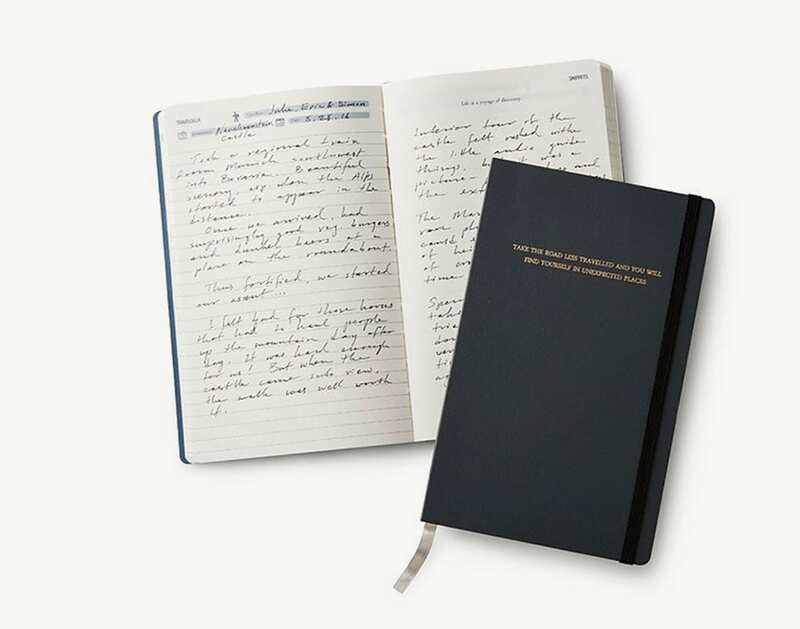 In fact, I’d argue that, pound for pound, memory for memory, nothing beats a travel journal. Even in 2018. And there’s some interesting science to back that up. Keeping a journal is good for you. There’s a growing body of research and clinical studies that show that physically writing and recollecting the events of the day or your emotional reaction to a person or place is not only great for your state of mind—journaling is beneficial to your health. James Pennebaker, a University of Texas at Austin psychologist and researcher has found that “regular journaling strengthens immune cells (called “T-lymphocytes”),” and that “writing about stressful events can act like a stress management tool, lowering blood pressure and the numerous harmful effects of stress.” Good thing traveling isn’t stressful, right? Still more research indicates that keeping a travel journal can decrease things like asthma symptoms and even rheumatoid arthritis. Writing in your journal at the start or the end of the day forces you to slow down and reflect on where you are—which can sometimes get lost in the hustle and bustle of seeing the sights, taking the perfect photo, and catching the next flight. Spend time between the pages of your journal and really soak in your trip while you’re actually on it. To help you do that, here some of the best travel journals, including some hi-tech cloud-based travel journals that let you record, backup, and even share your trip on the go. But Moleskine is taking it to the next level with quality paper travel journals that interface seamlessly with the cloud. Want to share your sketches and doodles with the world? Want to backup your entries and actually edit your drawings in Photoshop? Now you can. 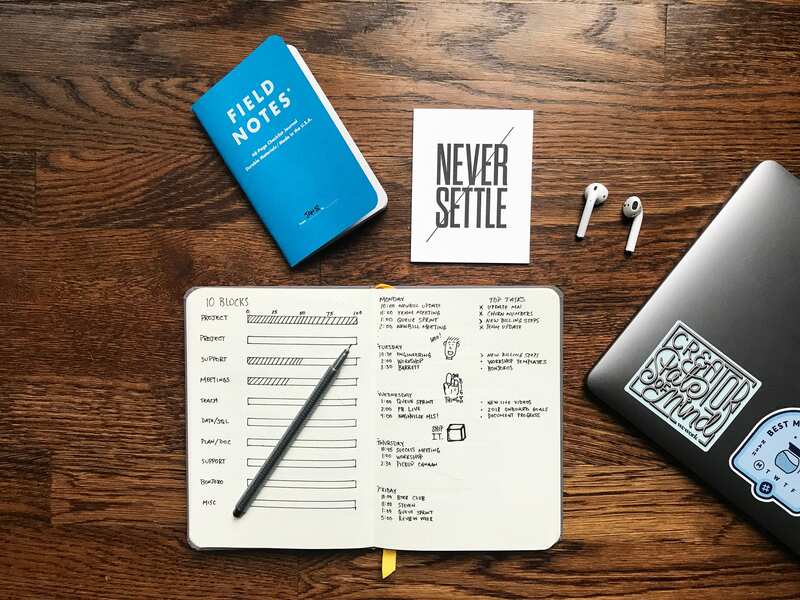 The Adobe Cloud enabled Moleskine Smart Travel Journal features a tiny dot matrix on every page that allows you to capture each page and upload it to your computer. You just download the Moleskine App and take a picture of the page you want to upload. The app recognizes the grid and places your artwork, notes, or images into a fully editable file that’s ready to go. It’s spooky to get your handwritten notes and doodles on your screen so easily, but the travel journal of the future is here, and it’s awesome. If you sketch, this is the travel journal for you. 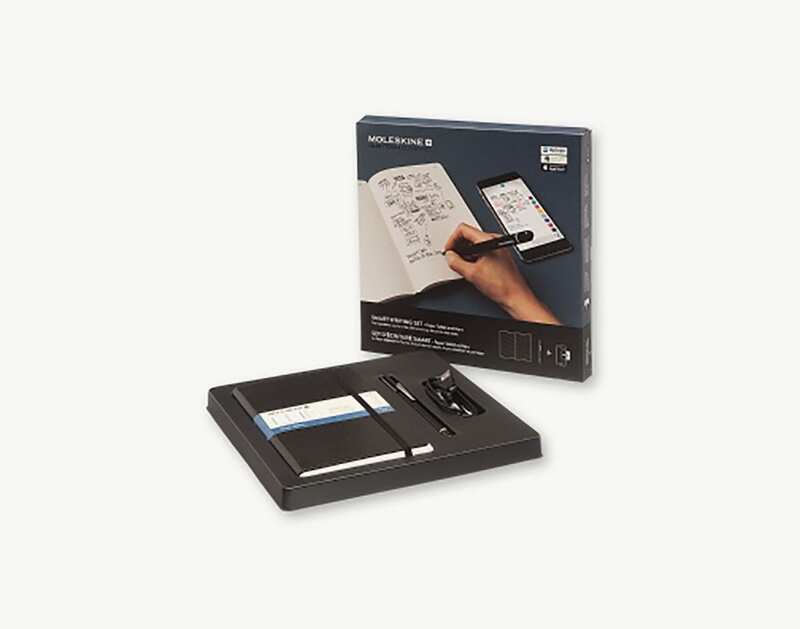 If you want to take your digital travel journal to the next level, check out the Moleskine Paper Tablet ($30) and Pen + Ellipse ($179). It’s super expensive, so I don’t give it my full endorsement, but if you’re a digital nomad doing heavy sketching, note taking, and even calendar management, this is a powerful tool. The pen and specially designed notebook capture each pen stroke in real time. You can doodle on paper and the pen and integrated app capture the image in the cloud. You can even write a calendar appointment in your notebook and the pen creates a Google calendar event. It’s kind of mind-bending, and well worth a look just to see what’s possible with the next generation of travel journals. If you’re excited by the idea of cloud compatible travel notebooks, but you don’t have the budget for a $200 smart writing system, the Rocketbook Everlast travel journal is an interesting alternative. You treat this notebook like any other travel journal, but when you want to upload the notes or sketches to the cloud, just tick one of the icons at the bottom of the page. Then just scan the page with your phone and the Rocketbook app (it takes about 2 seconds per page and you don’t have to click the camera button or anything), and your page will automatically upload to the designated folder in your cloud setup. You can even customize where the pages will go with specific folders and a range of compatible platforms like Evernote, Dropbox, Google Drive, Notes, and more. It’s actually pretty seamless. 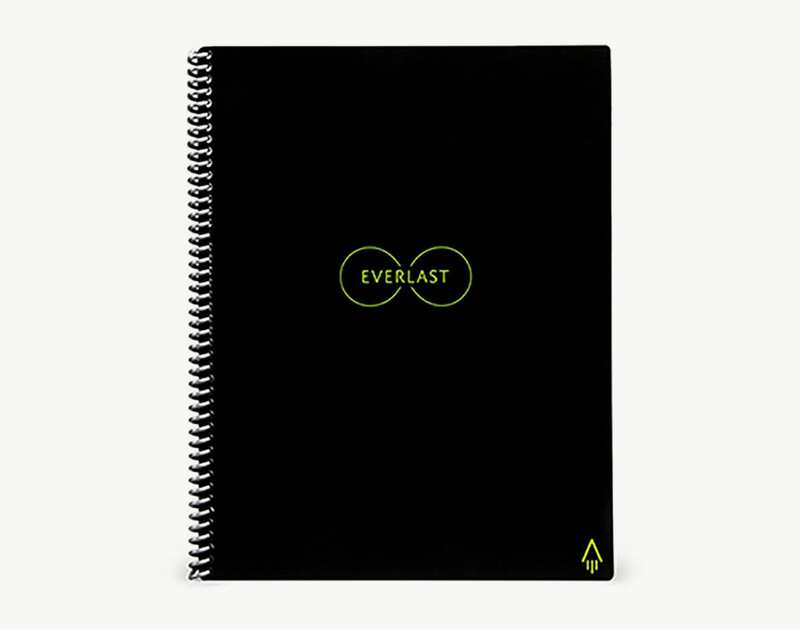 What makes the Everlast even more interesting is that you can erase the page with just a wet rag. They recommend that you use a Frixion pen (you can buy a 3-pack for $7). Once you’ve backed up your notes or journal entry, wipe the page clean and you’re all set to start again. Essentially, it’s a notebook that lasts forever. Thus the name. I’m a tad skeptical how this notebook will perform in places like SE Asia, and I’d be nervous to get it wet, but the seamless cloud backup is solid, and that’s the whole point. Jenn, our editor, has one of these, and she likes it, but says that spilling water really is an issue (everything disappears) and leaving it a hot car (or bag in the sun) will do the same. She lost three pages of book notes as a result of a hot summer day. Bummer. If you want something more permanent check out Rocketbook Wave ($27). This was their original flagship, and features the same cloud based functionality as the Everlast. The difference is how you erase the pages. 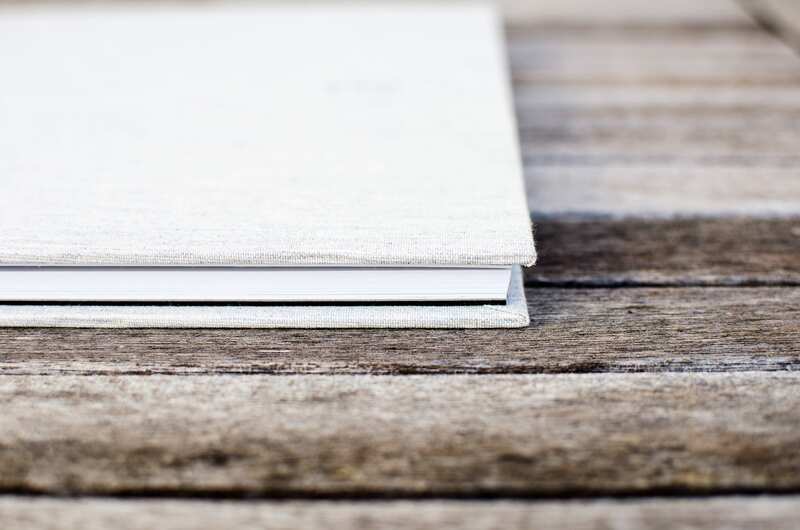 When you’re journal is full of sweet sweet memories, simply pop the journal in the microwave with a mug of water (yes, you read that right), and microwave the ink away in just 5 minutes. Again, you have to use Frixion pens, but it’s a solid design, and you won’t accidentally erase your whole journal if you spill a glass of water. Finally, you can opt for the Rocketbook Everlast Mini ($16) for the ultimate travel journal experience. It’s erasable just like the Everlast, but comes in a smaller journalist style notebook (the spiral is on the top). If you’re a lefty like me, you’ll appreciate the freedom from spiral notebook prints on your mitts. 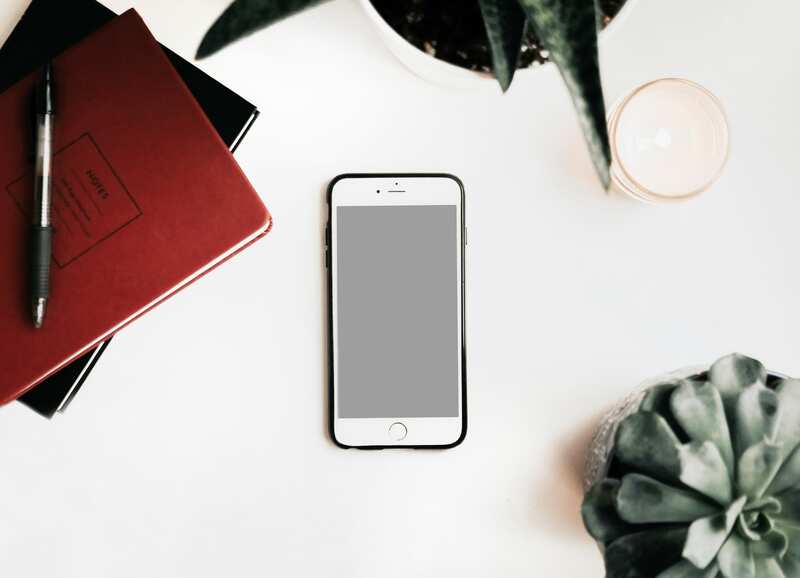 For even more about specific travel journal apps and cloud-based journaling features, check out Shannon’s great piece about the best alternative travel journal apps. You don’t need a flashy, fancy digitally-enhanced travel journal to capture your memories. Here are 5 of the best plain old fashioned paper travel journals that still rule. It’s a great go-to paper travel journal at a price you can afford. It’s hard to stay organized and motivated on the road—especially if you’re a working digital nomad. Meeting deadlines and working on passion projects can be tough when you’re jumping time zones and chasing festivals. 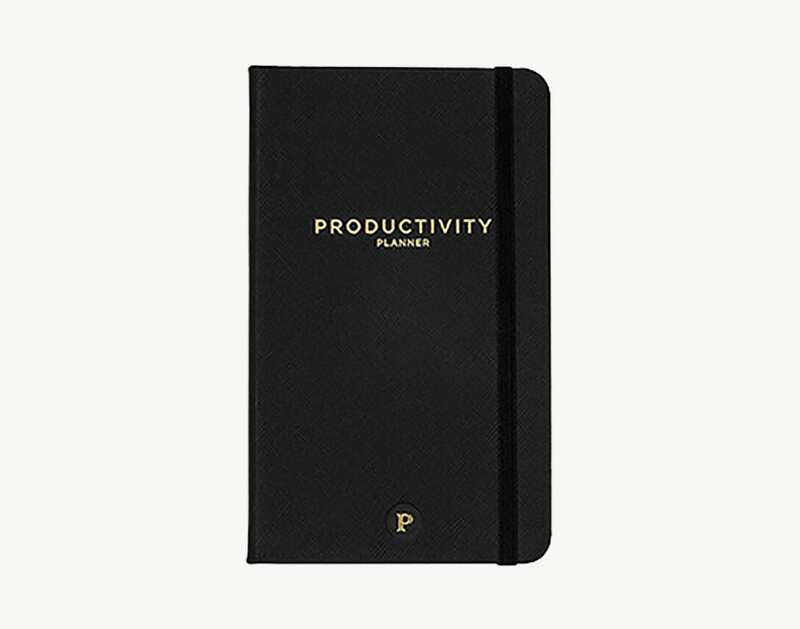 Stay on top of your goals with this streamlined productivity planner. Some people complain that each page isn’t big enough and doesn’t offer enough room for all of their daily goals, but that’s the wrong way to look at it. If you want to be truly productive you have to prioritize and simplify. You can’t get 20 things done in a single day; at least not 20 important things. This travel journal helps you identify the things that you actually need to get done, and then holds you accountable for doing them. (You can score your productivity at the end of each week. Talk about brutal). I’m a big fan of travel journals that help you get sh*t done. And this one does. 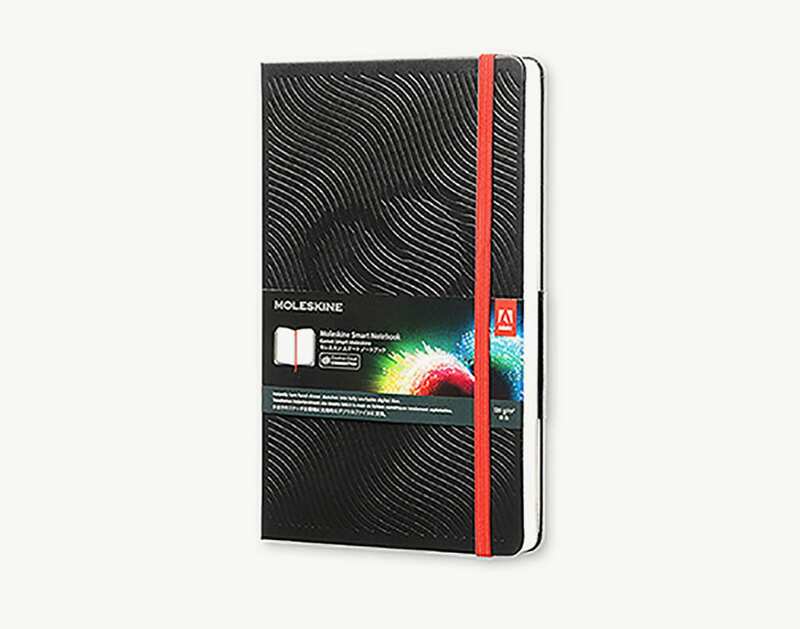 The clean minimalist design and lay flat functionality (not to mention the beautiful colorful cover art) make this the perfect travel journal for capturing your thoughts on a long trip. Over 200 pages crammed into a 7 ounce package, the Wanderlust travel journal is efficiently laid out with heading sections (including destination and date tabs) so you can just start writing. And it’s got gold leafed edges. So that’s sweet. This journal typically sells out pretty quickly (I’ve had to wait several times to get it) so if it’s available, jump on it. 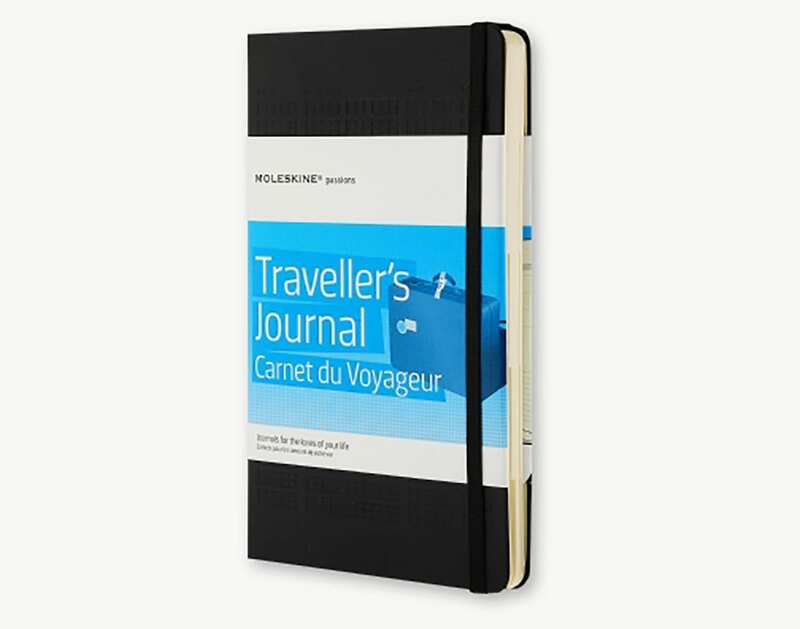 This travel journal is more of a tool than a blank notebook. If you want to really get into the nitty gritty, look no further. If you want to kick it really old school, the leather travel journal from Sahara Crafts is for you. 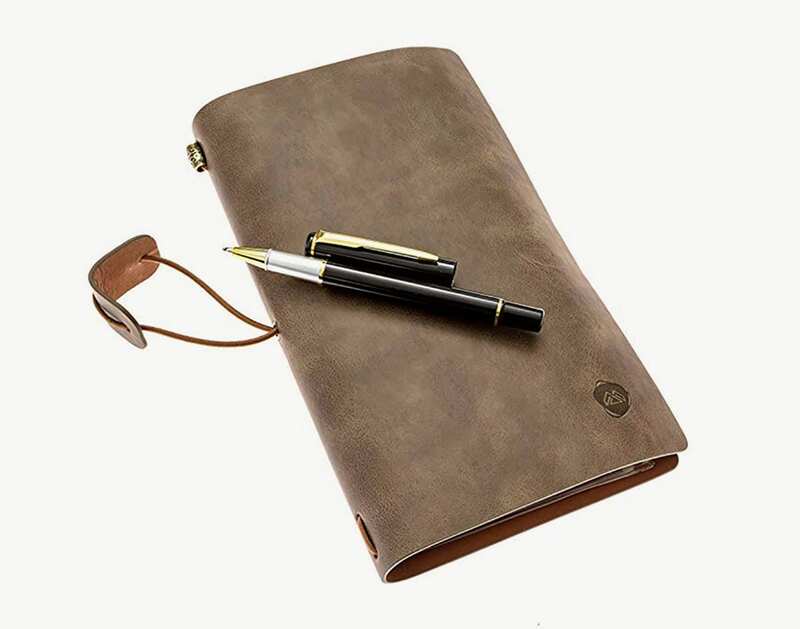 It’s a classic, with lined pages and a soft, pliable leather cover that lets you pretend you’re freaking Indiana Jones. Personally, I dig (see what I did there?) the flexibility of a soft cover travel journal. It’s perfect for cramming into any pocket. And the hits don’t stop there. You can refill the travel journal with fresh pages when you make a sequel, start your next adventure, so you can keep your trips organized. Oh, and did I mention that it comes with a stylish ballpoint pen? Yeah. This travel journal is a classic and a bargain, which is the most precious find of all. A physical travel journal is not only the best way to capture your travel experiences, it’s good for your mind and body. Plus, today’s best travel journals are cloud-enabled, digitally enhanced, and eco-friendly so you can use them for years. 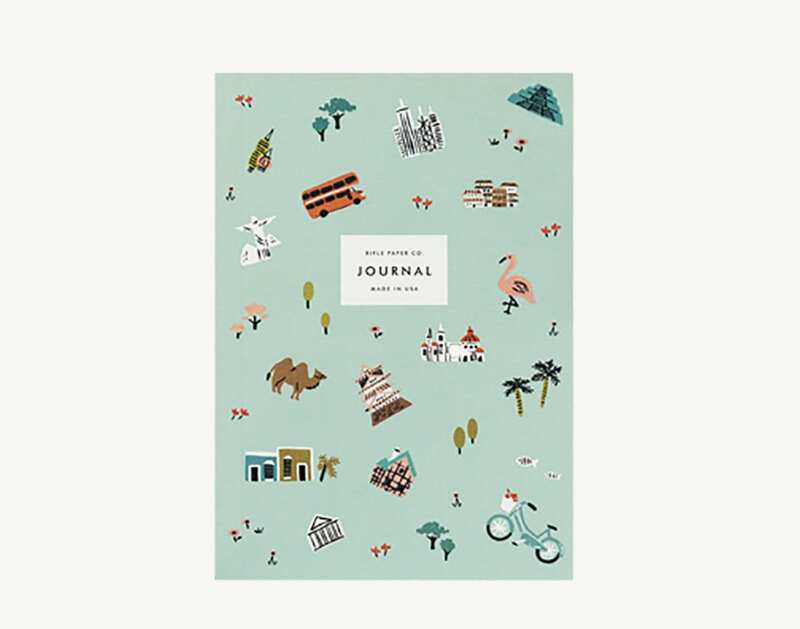 You can get a state of the art travel journal for less than you think. Research shows that journalling is good for you. Get weekly gear reviews, travel hacks, and packing tips sent straight to your inbox. We’ll send you a carry on packing list right away. We couldn't find the perfect travel backpack, so we made it. After fielding countless packing and travel questions from customers at Tortuga, we started this blog to share the answers. Join our mailing list to get your packing checklist and biweekly packing tips sent straight to your inbox. Spam is the worst, so we won’t send you any.